Launching before sunset we will give witnesses to a rapidly changing landscape of colors and moods; from golden to pinkish to purple ... the mountains, treetops, reeds and reflective water will transform like magic! Shortly after bats will begin eating, chirping and whizzing about the sky. Next the likely chorus of frogs will cheer on nightfall as their calls travel over water so smooth that swimming beavers seem to be parting glass. Yet the real fun has just begun. Even when a full moon brightly illuminates the landscape, one's eyes loose depth perception and all becomes ever so slightly a different reality. 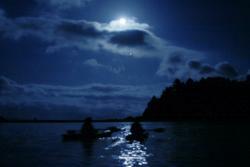 Poking up from behind the forested waterside, a solid beam of moonlight streaks across the lake to greet you. It won't be long now until the Milky Way and other constellations reflect off the water's surface so brightly that it becomes difficult to discern where the sky begins and the water ends. Come paddle across the universe to open your mind and experience a different world.